To record the best images of the planets, the Moon or the Sun, amateur astronomers use cameras equipped with sensitive sensors and small pixels (to generate high magnification and high resolution) capable of video recording. From these, using special softwares, they get fantastic images even of the smallest details. The ATIK GP monochrome camera offers all these features together with a high sensitivity sensor and, for that reason, it can be used as an autoguider. This sensor can also be used for special images such as the Moon or Mars in the infrared, Venus in ultraviolet or the Sun with solar H-alpha filters. Due to the high sensitivity it can also be used to record the brightest galaxies, nebulae and star clusters. 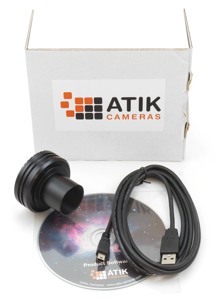 The Atik GP is a great camera to record planets and the Moon in high resolution! Its compact size and light weight make it a joy to use on telescopes large and small. The sensor used is the fantastically sensitive 1.3 million pixel ICX445 EXview II CCD from Sony. The GP is capable of up to 30 frames per second and will download both 8bit data with the convenience of saving to standard video avi file format, or 12bit for full dynamic range images as Tif and Fits format. When used with the included GPAcquire software the camera is fully configurable with gain, region of interest, data format and a myriad of other settings enabling optimal planetary, solar and lunar imaging (Note: observe or photograph the Sun ALWAYS with the right protection filters!). Data can be save direct to disk or initially to memory to optimise frame rates with slightly slower hardware. The advanced passive cooling allows images up to several seconds to be collected, ideal for guiding. The camera is fully compatible with existing Atik software so can be used with our (included) Capture software as well as plug ins for Maxim DL, AstroArt, and more though the ASCOM camera interface. Controlled this way it behaves much the same as our bigger cameras and will allow binning and sub framing. Guiding corrections are passed to the mount using an ASCOM interface. But it does require that the mount is ASCOM compatible and linked to the computer. System requirements: Pentium IV PC with 512MB RAM, Windows XP/Vista/Win7/Win8 (not RT), CD-ROM drive and USB 2.0 port.